The art of jumping becomes a worldwide sensation... maybe. 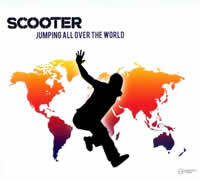 Surprisingly enough, Scooter achieved a high amount of success in 2007 with their first two jumpstyle-themed singles, "The Question Is What Is The Question" and "And No Matches", both of which I have previously reviewed. Being the enjoyers of chart success that they seem to be, the three Hamburg-based producers of Scooter have released yet another jumpstyle single, this time the title track from their recent album. I had proclaimed the song as one of the strongest tracks available from the album, and my opinion of that has not yet changed. The Radio Edit of "Jumping All Over The World" has been significantly reworked but retains all of the elements from the album version. The chorus still centres around a retooling of the 1975 novelty hit "A Glass Of Champagne" by Sailor. Of course, this version is faster, boasts tweaked lyrics, and uses high-pitched vocals. However, a number of additions and alterations have been made, including a new intro involving an airport announcement system paging the three group members to Boarding Gate 38, a second verse from H.P. Baxxter (frontman) with even crazier lyrics, and a new bridge where H.P. shouts out the names of many major countries all over the world where jumping should apparently occur. The second high-pitched chorus was also cut in half, which is probably a relief for all those fans who thought the album version chorus was too long (and it is). There is also a technical fix which removes the annoying "ch" sound at the end of the fourth line of the first verse, which was present on the album version (the remnants of a lost line that actually can still be found in the album's lyrics booklet). The song is a good mix of jumpstyle and a healthy dose of hardstyle as well (with some thick bass in there for kicks). If you try and dance to this, you'll certainly become short of breath within a couple of minutes, because it's a doozy! There are two other mixes of the track on this single as well. The Jacques Renault Club Mix (named after a character from the movie "Twin Peaks" apparently) adds an extra repeated chime melody before arriving at the main chorus of the song. Also included is a really cool sample of some guy saying "Face back!" That is the best part of the Club Mix for me, and I have no idea why. There are also no H.P. shouts are present in the club mix, but they ARE available in full in the Extended Mix, which is merely a lengthening of the Radio Edit. And as with most Scooter singles, there is the standard B-Side. In this case, it's Tribal Tango, a jumpstyle remix of an actual tango song. It often sounds repetitive but slightly catchy, and features some weird jungle sounds in there. It's alright if you want to jump in the ballroom, but there is nothing particularly special (or horrible, I suppose) about this track. On the German physical CD single (but not released digitally anywhere), there was a second B-Side called B.O.B. (also named after another character from "Twin Peaks") which samples Laura Palmer's Theme from "Twin Peaks", as well as Moby's "Go". It's pretty neat and a bit dark. Of the three jumpstyle singles, it was "Jumping All Over The World" that most pleased me upon my first listening. It has a certain element of roughness that I find enjoyable. The only thing that you really need to be fully aware of before acquiring this single is that if you find that there's been too much of that jumpstyle clap sound in Scooter's past pair of singles, you'll go bonkers with this one since it is still there. However, for those fans who love Scooter and its current jumpstyle direction (which, presumably, will not last forever), this single will not disappoint you. And frankly, if you have to pick only one, this might be the best choice: it's the toughest of the trio!